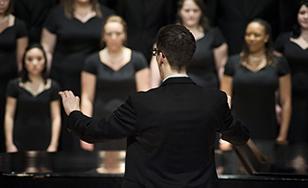 St. Scholastica will host a collaborative choir concert at 3:30 p.m. Saturday, April 8 in the Mitchell Auditorium on campus. "Still I Rise: Songs of Struggle and Strength" will feature the collegiate women's choirs of St. Scholastica, the College of Saint Benedict, University of Northwestern - St. Paul, St. Cloud State University, and the University of St. Thomas. The choirs will highlight the link between the arts, education, and social justice as they perform songs of struggle, strength, and empowerment. There is no admission charge, but donations will be accepted. All proceeds will benefit Safe Haven Shelter and Resource Center. For more information, call 218-723-7000 or visit spotlight.css.edu.